Love this Autumn render of Dapplewood, Can't wait for The Winter Dapplewood, Awesome Colours Ryan. Exceptional serene scene. A place to go hiking and canoe trips. This is superior to your original version. The colours and light are fantastic. More like this please. Thanks for listening to our thoughts on FB! This is much better than the original. I love it! I really like the light and color. Very shady which makes it seem inviting. Your art has helped me adjust to the changing seasons for many years now. Thanks so much. MUCH improved. This version is wonderful; I'm enjoying it on phone and desktop. 10+! The 3840x1080 dualscreen image appears to be missing. Otherwise, I really enjoy this one. I prefer the newer version but on my phone I have the original version for the lock screen and the new version for the home screen. Makes for a nice transition effect when unlocking my phone! I really like this one. It creates a very tranquil, "fall day" feeling. The only suggestion I'd presume to make would be to SLIGHTLY increase the overall warmth of the image. Perhaps my all-time DB favorite is another autumn selection, the richly warm "Last Gold" from way back in 2001. Many might find Last Gold too warm, but for me, it's sublimely just right. In fact, I just shifted my desktop Last Gold for the fall season. This new Dapplewood variation came close to displacing Last Gold -- but not quite. And for me, that's because of the warmth. Still, a very, very nice work. Thank you Ryan, Keep up the OUTSTANDING work! Agreed, much better with a little less sunlight. Can't wait to put the triple-screen version on my setup! Quite a few of my Members suggested that maybe the sunbeams in my first version of "Dapplewood (Autumn)" were a bit too overwhelming. I tried out a test version with more subdued haze it did indeed look better. I've replaced the first version in my gallery (it's still available in the Pickle Jar) so let me know what you think. Dual and triple-screen versions coming shortly! There should be a 3840 x 1080 version of most of my dual-screen images. Another great work!! Also, I wondered what resolution I should use for a dual monitor running each screen at 1920x1080? Should I use the 3840x1200 under the dual screen section? Thanks! I love the colour palette in this image. Amazing. I think you perfectly captured that early to mid fall when the leaves are changing but the shrubbery is still green. Love the moment. I wouldn't change a thing. Another nice one Ryan. I always find it strange to see "calendar" events like these, when here in the southern hemisphere our trees are just starting to bud (well they are where I live anyway!). I love your Autumn images! Keep up the great work! This scene is gorgeous, but the sunlight rays are much too bright and prominent for my liking. It's as if the light is actually obscuring the scene rather than illuminating it. I love it when you use light more subtly and softly. Would love to see this work without any rays at all. While I see what others are saying about the sun rays, bit wouldn't they be at that angle if the sun was overhead at noon? I'll be looking forward to seeing an amended version in the pickle jar and do a side-by-side comparison. Regardless, this is a wonderful render and I love the color palette. THANKS, Ryan!! Another stunning Autumn render. However, I can see what some of the other comments are getting at about the suns rays being too bright, and it occurs to me that perhaps for deep Autumn the suns rays should be at a lower angle. These rays look more like Summertime. On the other hand, beautiful colors. Ryan, every time I think you make one that can't be outdone, you do one better. This is probably your best work, yet (IMO). I can only rate it a 10, but it deserves a 123,456,789 rating. Truly amazing. no 3440 x 1440 (21:9) ? I'm delighted to see you're doing seasonal renders of Dapplewood, Ryan; I was hoping you would. However, I think Littlemom has a point. 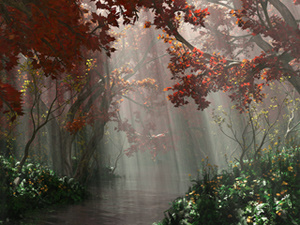 The sun rays mute the fall colors and diminish some of the impact the foliage should have. Could the rays be toned down a bit?